EXO Travel Group is pleased to announce the appointment of Maeve Nolan as LUXE by EXO Director. Launched in October 2017, LUXE by EXO focuses on unveiling a premium selection of experiences and services across Asia. 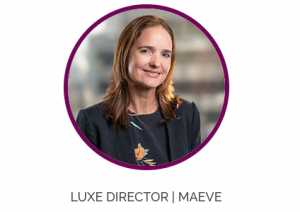 Maeve, based at EXO Group’s Bangkok Head Office, will be responsible for delivering the highest level of service to EXO’s luxury clientele and also leading LUXE business and product development. Maeve is uniquely suited to fill the LUXE by EXO role. She has not only called Asia her home for over 20 years, but her professional career in travel has allowed her unsurpassed insider access. Having moved to Hanoi Vietnam in 1998, when cyclos and bicycles still ruled the streets, she has been travelling extensively across Asia ever since. She moved to Bangkok in 2011. Maeve is an Australian national, though Scottish by birth and Asian at heart. Her deep passion for travel has driven her to relentlessly explore the unknown, be it luxury hotels on remote islands or delving deeper into insider experiences. Crazy about arts and culture in all its guises, Maeve sees her position at LUXE as her next great journey.